My most successful and favorite project was my layered seasons project because it used mediums that I don't usually use and still turned out really cool looking. The theme of my project was the seasons because they seasons' characteristics often overlap each other but are still unique to themselves and decided to show that using the layers of foam, collages, and additional materials. The size of my project was good because it allowed each season to be large enough to be seen and identified as their own layer but wasn't too big that it took away from the seasons being a whole. I used bright colors to carefully represent the characteristics of each season but made sure that they still had some contrast that differentiated the layers. I also added strips of black paper along the side to make sure that not only was my project neat from above, but the sides of Styrofoam were also covered. By using pictures, I was able to capture every aspect of those seasons and still have it not come across as too much. Overall, I was extremely satisfied with the 3D effect of the layered seasons and collages. I think my text as an element project had the most obstacles to overcome because of the several different mediums an techniques I used in the making. 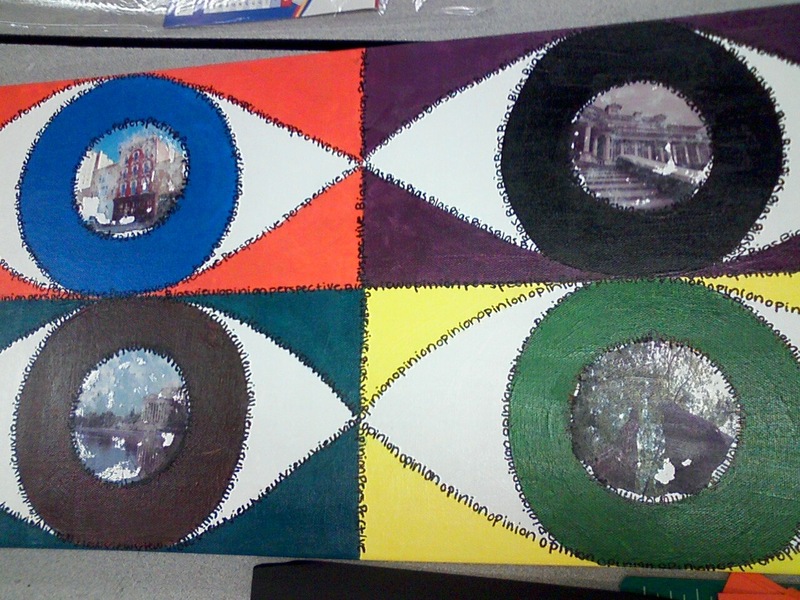 I used photo transfers for the first time incorporated into my project to provide images that represented the sense of perspective in the piece. 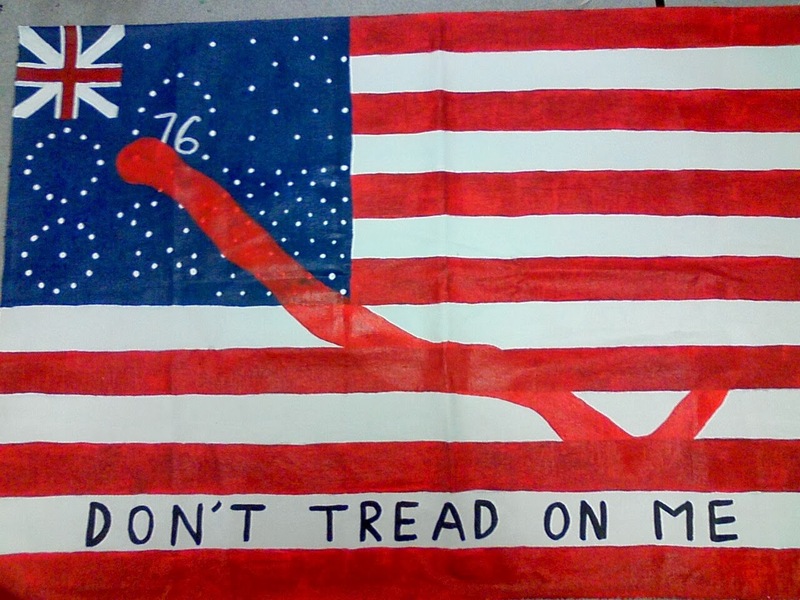 Although the text was simple to do, I was kind of uncertain as I was doing it because of the off chance that my hand might slip and smear Sharpie across the paint. I was really happy with the end result because of the effect of the photo transfers had on my piece and because they had taken a lot of time and effort to complete. The pictures I used, were all ones I took on different trips to the mountains, Cone Manor, Washington D.C., and of course Raleigh. By taking these risks, they made me more willing to expanding to use new mediums and to experiment with new techniques. The first piece was my Intertextuality project and I used colored pencils and then used water over in order to blend the colors more. 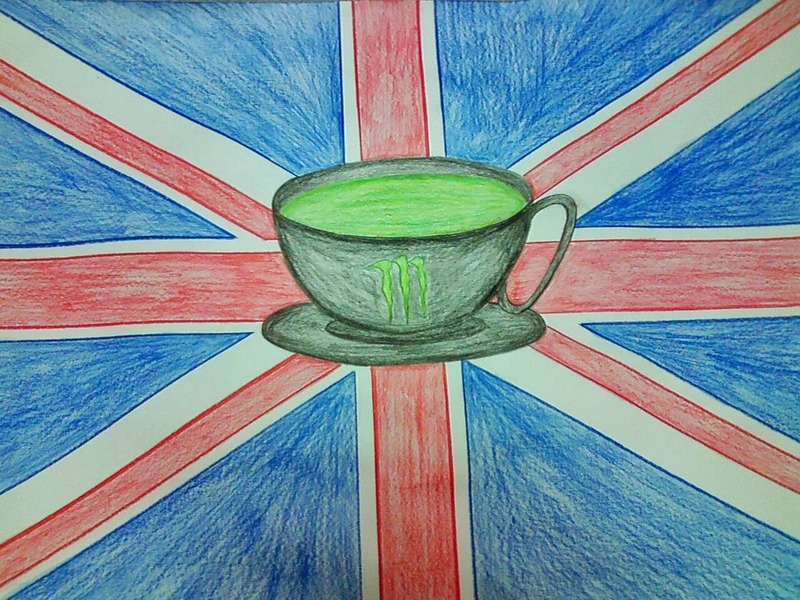 My inspiration came from wanting to do something that depicts the English tea cup but pair it with something totally opposite, in this case the drink Monster. I was taking risks with the water topcoat because I wasn't sure how well it would blend the colors or if it would wrinkle the paper too much. While it did affect the paper some, it also helped my colors stand out more. Even though it turned out alright, I wasn't happy with the overall topic or the end result and I know that I probably could have done better work. For my second piece I chose to represent the seasons for my layering project because there are so many aspects of every season and every season should be depicted uniquely. I used pictures in collages to represent the seasons because they enabled me to capture more aspects and different colors seen in each season. By using small objects and pictures, I could depict any aspect of the season without taking away from the overall project. I wanted to show all the seasons layered on top of each other to represent how each season depends on the other but at the same time show the difference between them. I used many more types of material sin this project compared to the intertexuality project and therefore I was able to use more contrast and I was extremely happy with the concepts, ideas, and materials behind the project as well as my end result. These projects would have all turned out differently without the freedom to do whatever we wished because I might have done them with other materials or done something completely different. I'm glad we could do whatever we though of because it forced me to think outside the box and come up with my own inspiration to create pieces I would be proud of. I was also allowed to use a vast amount of materials and that allowed me to experiment with different materials and techniques that increased my knowledge of the different elements and uses of art. I was able to use materials that I had never experimented with before that allowed me to add experience to my portfolio.